It’s Asparagus season, and one of the best times to eat it is early Spring when it is local and the stalks are thick and juicy! Asparagus is a perennial. It takes three years after planting asparagus to strengthen the roots and start harvesting it. After that it just gives and gives every Spring. I find that as the weather warms the stalks get thinner, so I like to make this side when they are fat and abundant. Asparagus is packed with nutrients like folate, vitamins E, C, A and K, as well as a trace mineral, chromium, that heightens the ability of insulin to transport glucose from the bloodstream into cells. Asparagus also contains soluble and insoluble fiber. It is also is a good source of the antioxidant glutathione which is said to slow the aging process and benefit your skin. Did you know Asparagus can grow as much as ten inches in 24 hours? Amazing! It is also a natural diuretic and can help the body get rid of excess salt and fluid. One caveat – If you have had calcium kidney stones or gout, asparagus is one of the foods to avoid (see here). The recipe is simple and delicious! Preheat your oven to 450º degrees. Lay out a parchment lined, rimmed baking sheet. 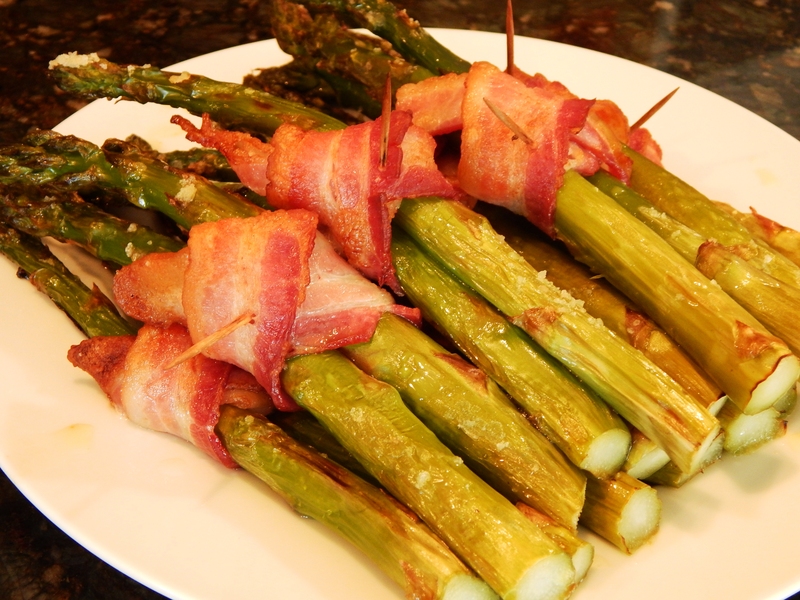 Wrap a piece of bacon around two fat stalks of asparagus (or three to four thinner stalks) and secure with a toothpick. Set the eight bundles on your prepared baking sheet and brush with Coconut Oil or Olive Oil. Sprinkle the asparagus with the coarse salt. 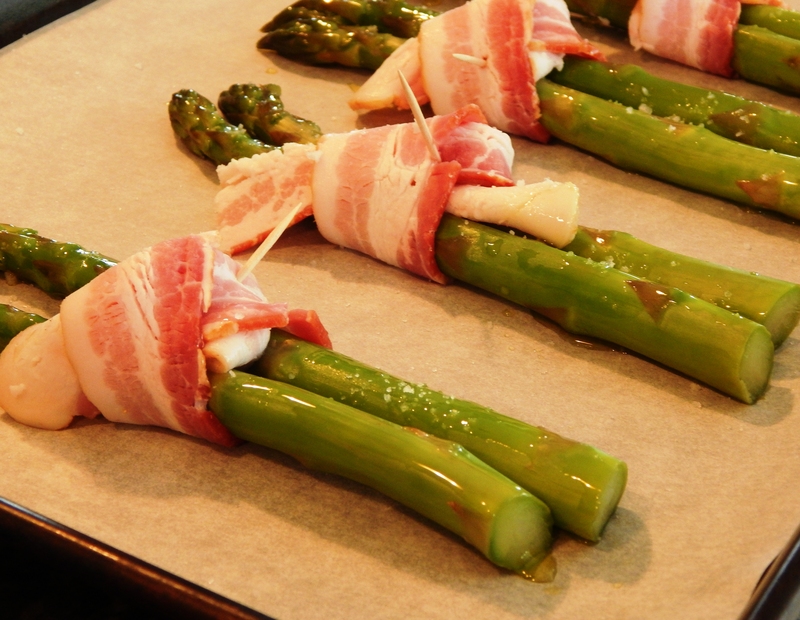 Place in your oven 10 to 12 minutes until the bacon has crisped and the asparagus is nicely roasted. 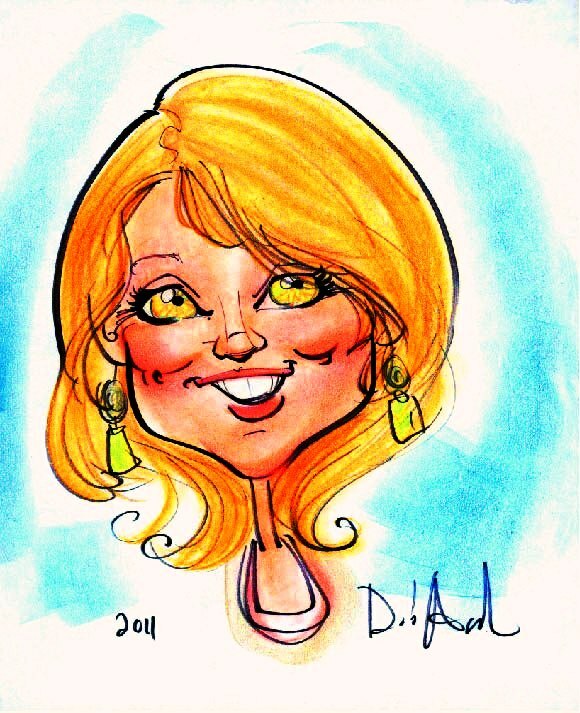 Get-togethers with friends nourishes the soul as well as the body. Food is at the heart of community when you think about it. Most events, parties and time spent in celebration with others involves some type of food, traditions and favorite regional dishes. It is also seasonal, so in the Fall and Winter we eat more heavy warming food, and in the Spring and Summer our bodies tend crave lighter food. This works perfectly in eating locally. I encourage you to listen to your body. What is it telling you? 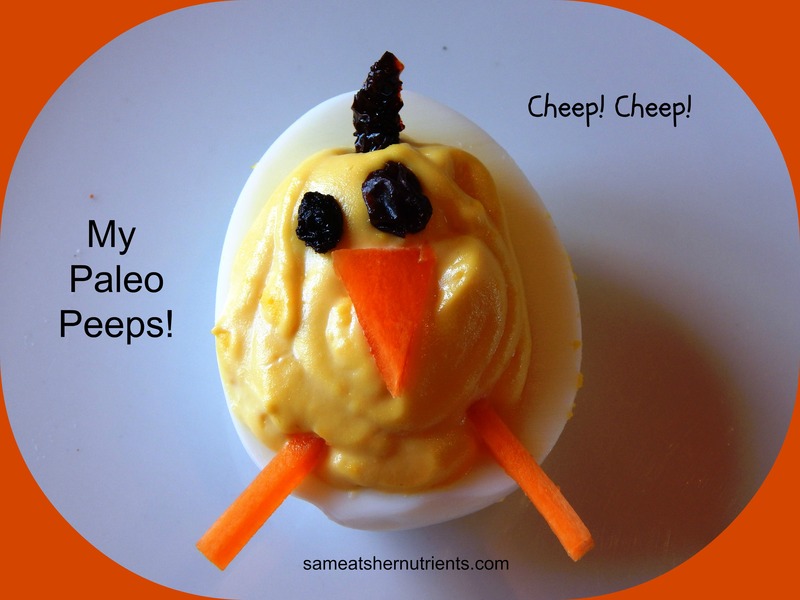 My Paleo Peeps is a fun way to serve deviled eggs. 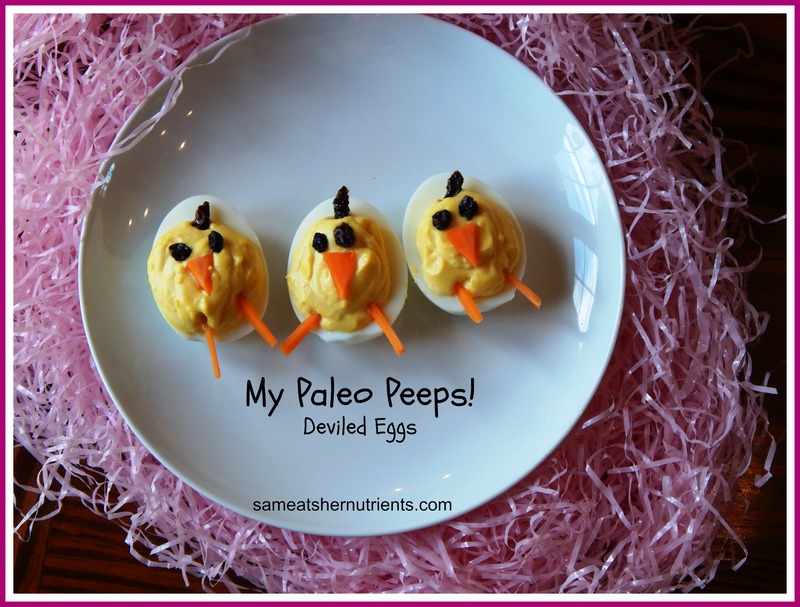 Take them to a get together, or invite some peeps to a picnic to celebrate Spring. Immerse yourself in community with others and nourish your body and soul! I used local pastured eggs in this recipe. The yolks are yellow and full of nutrition! Although I regularly make homemade clean mayonnaise with my immersion blender, I am in love with Primal Kitchens new Mayo made with avocado oil and completely clean ingredients! It is so good and convenient! 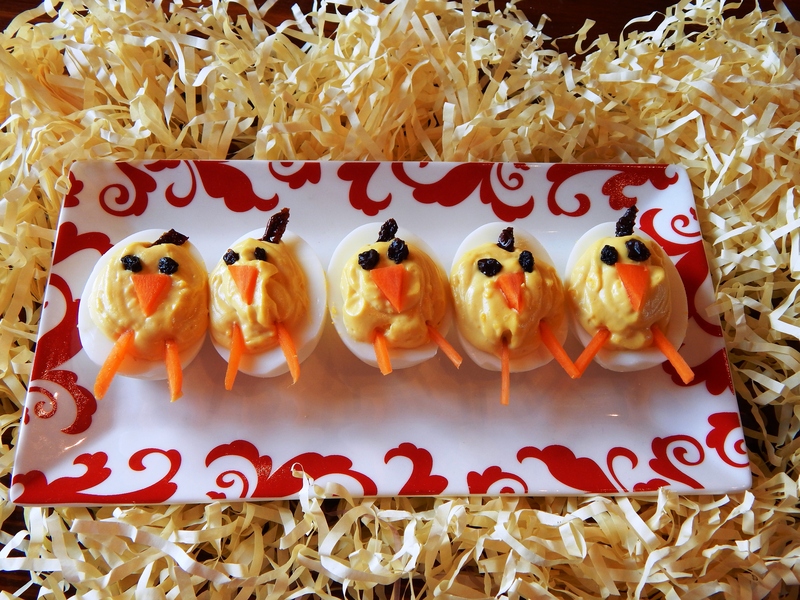 I used it in these deviled eggs, or you can make or choose your own favorite brand. Here is my favorite homemade recipe, because it is fail proof. You need an immersion blender, and it is super fast! 1/2 Cup Good Quality Mayo (I used Primal Kitchen Avocado Oil Mayo). Directions: Slice the eggs in half from tip to bottom. Remove the yolks and mash with the mayonnaise, mustard and salt. Put the egg yolk mixture in a quart size ziplock bag and snip off the end of the bag. Pipe the yolk mixture evenly into the egg halves. 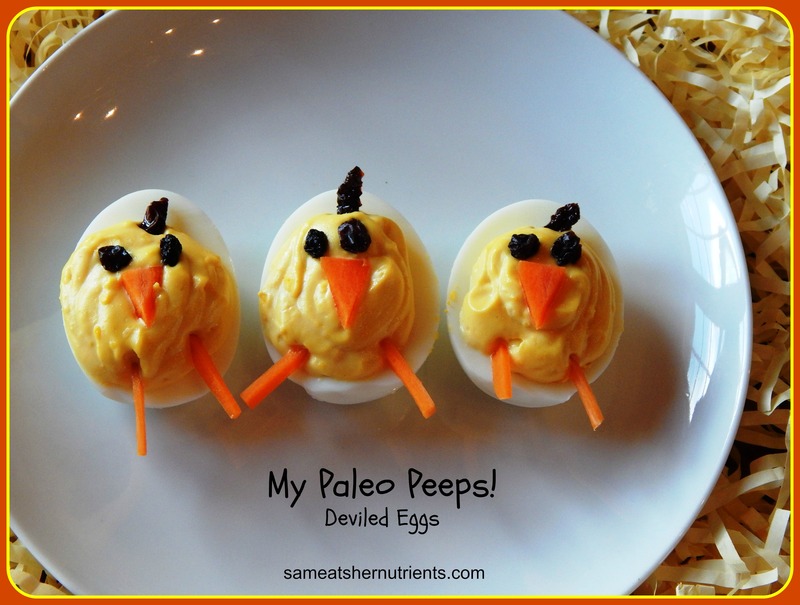 Now decorate your peeps! Currants for the eyes, slice your carrot into beak shapes and skinny slivers for the feet, and take a small snippet of sundried tomato for the wattle! Refrigerate an hour or more before serving to set the filling. I am so happy to see the Spring produce start to come in at my local organic market. 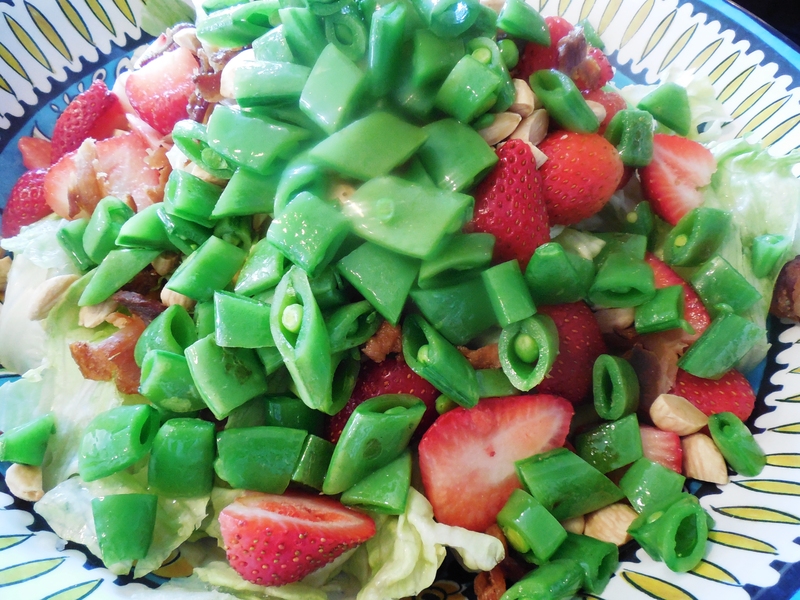 This week, I picked up some beautiful organic sugar snap peas and strawberries that inspired me to make this bright and colorful salad. 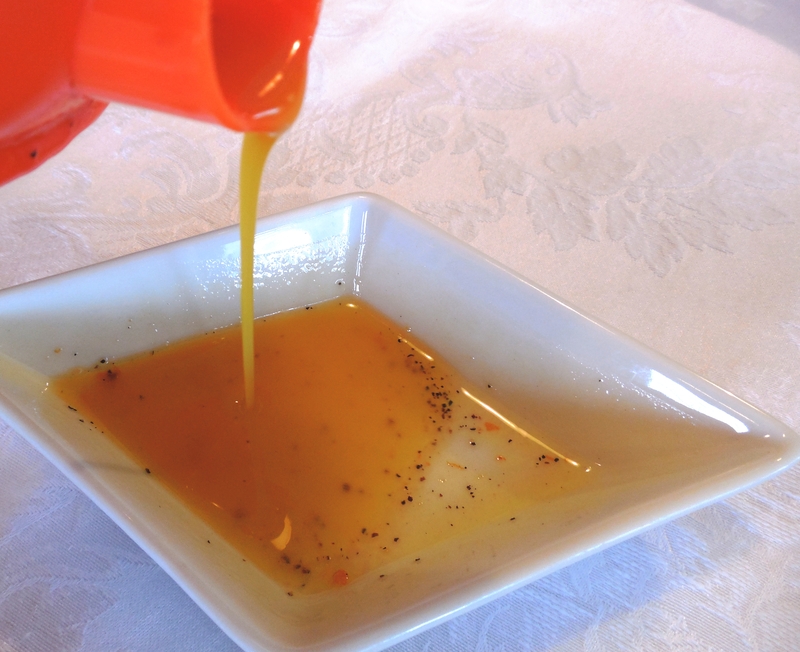 I paired it with an orange vinaigrette, and it was a big hit! I sliced the sugar snap peas into 1 inch pieces and lightly sauteed them in olive oil and Pink Himalayan salt before adding them to the salad, so they are still crunchy. Saute the one inch sliced sugar snap peas in olive oil and 1/4 teaspoon of salt until tender, crisp, just 2 minutes. Add other ingredients except dressing to a large serving bowl, top with sugar snap peas, then toss with Orange Vinaigrette, sprinkle with a little more Himalayan Pink Salt (Kelly Bejelly of A Girl Worth Saving just wrote an informative article on the benefits of this salt), pepper, and serve. A delicious spring salad! This is one of my favorite salad dressing at the moment. I love the bright orange flavor. Whisk Together the ingredients and serve!